My last memory of speaking to Marco Simoncelli was at breakfast on Sunday morning at the Pan Pacific hotel where almost all of the MotoGP paddock stay in Sepang, Malaysia. The hotel put on a huge breakfast buffet, with lots of options to suit different tastes but as I was leaving the breakfast room to head for the circuit, I saw Marco sit down with two boxes of cereal he had brought from home. As I walked past him I asked "Marco, you brought your own cereal here?" and he, with a mouth full of food, just nodded and laughed. That was Marco. A demon rider on the track; exciting, flamboyant, aggressive and daring, but off it quiet and unassuming. There was no entourage, no flashiness and no mind games, just Marco, his dad Paolo and his home comforts. Marco did his talking where it mattered - on the track. As a person Marco was witty, intelligent and charmingly funny, but also very polite, patient and gentle. Sometimes we worried that the full extent of his humour was lost in translation for non-Italian audiences but he had a range of smiles that seemed to convey his feelings, whether the joyful grin of a podium, the cheeky smile that came with a funny retort to a question, or the "next time" smile after the disappointment of a retirement or crash. Marco had a great ability to poke fun at himself but also to take things in his stride. A great example of this came in the post-qualifying press conference in Estoril earlier this year. Reigning champion Jorge Lorenzo accused Simoncelli of being dangerous and said: "In the future if there is a problem with you, it will be a problem." The room was tense but Simoncelli just turned to his rival and joked: "Ok, I will be arrested." It was classic Simoncelli; not taking things too seriously. That's not to say he didn't understand or respect the dangers out on track, he was clearly learning and maturing race by race, but he wasn't going to let the polemic bring him down or change who he was on the bike. Two races later, when he was booed every time he stepped out of the garage by the Spanish fans angry at his collision with Dani Pedrosa in Le Mans, Marco responded not with bitterness or angry words but by taking pole position. In the subsequent race we perhaps saw him more affected by the events, he rode to a cautious sixth place, never really pushing or troubling the front group. It was a race he needed to do at the time; one where he arrived at the finish first, and secondly without causing any controversy. As a fan though you really hoped to see the real Simoncelli back and battling again and, sure enough, in the next race at Silverstone when he found himself in third position, 12 laps away from his first MotoGP podium, he set off to charge down Andrea Dovizioso in second before crashing out two laps later. That hot-headedness was something that we had yet to see him curb but that heart and desire to push for more was exactly what endeared him to fans across the world. In the period where the crashes, DNFs and criticism wouldn't stop coming you wondered how his confidence could withstand it all. But, throughout this period of self-discovery, Marco never gave up trying and never gave up smiling. He kept his cool in adversity, never got angry and never blamed other people for his mistakes. When in Brno that first podium did come, the feeling was that this was really the start of Marco's great MotoGP career, with wins and championship battles destined for the near future. Indeed, there were no more rash moves or DNFs for the Italian after that, only three fourth place finishes and a premier-class best of second at Philip Island. This season, the only rider that Simoncelli failed to beat in a race was recently crowned world champion Casey Stoner. He showed his worth against all the other riders and he did it without mind games. Yes, there were controversies, learning curves and, at times, fierce rivalries but the truth is, you don't get to be the greatest without creating rivalries and for me it is a testament to how great Simoncelli was that he had so many individual rivals within his peers in MotoGP. The history of hard racing in 250s with the likes of Hector Barbera, Alvaro Bautista, Lorenzo and Hiroshi Aoyama gave a special edge to their continued battles on the MotoGP track. This year the battles with his HRC factory counterparts Stoner, Pedrosa and particularly Dovizioso, Marco's oldest and bitterest rival since the early days of Italian Minimoto, have been thrilling to watch. There was no love lost between the pair but Dovizioso will surely miss those battles against his compatriot, as MotoGP fans across the world certainly will. 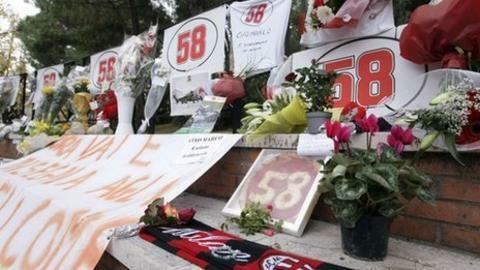 As an expected 60,000 fans gather alongside family, friends and paddock members to pay their respects to the great young racer at his funeral in Coriano, Italy, on Thursday, we are left to reflect on a tragically short but wonderfully fulfilled racing career and the legacy left behind. For racing fans there will be a void in the chase between the front groups in races to come, for the journalists there will be a void in playful humour to write about and for his fellow riders on track, whether they loved him or loathed him, you can bet they will feel the void of battling with him.